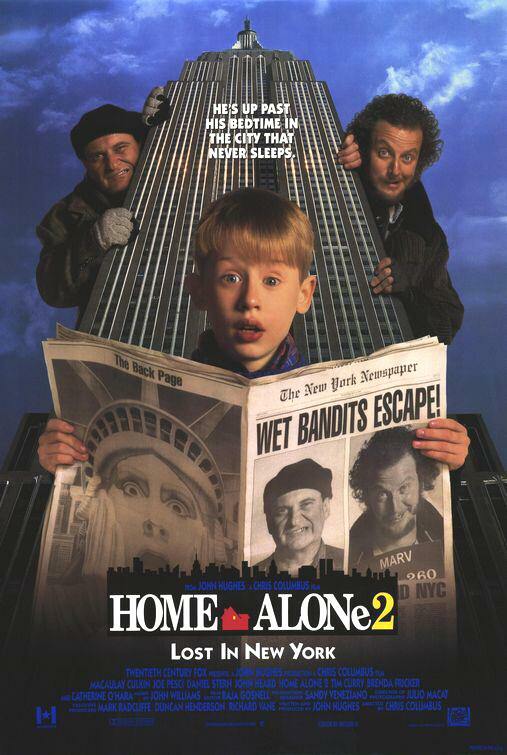 Dan: Why are you watching “Home Alone 2” the day after Christmas? Isn’t the season over? Josh: Tisk, tisk Mr. Scrooge. The season is never over if you keep it in your heart. J: Sure. Plus, we never got around to watching this one. D: That’s because we didn’t need to. It’s the exact same movie as the first one. J: But he’s lost… in NEW YORK! Besides, I like this one better. Not only does Kevin have a myriad of wacky adventures in the big city, but he also gives the scary, homeless pigeon woman turtledoves at the end. Isn’t that wonderful? I mean, yeah, he doesn’t invite her in from the cold for a hot meal or anything, but by giving her an ornament that symbolizes their meaningful yet ultimately temporary friendship we all get to understand what the true meaning of Christmas is! D: That’s a pretty awful message to send. An ornament? J: Yeah, what’s wrong with that? D: Well, it seems to me the true meaning of Christmas has something in its fine print about doing more for the homeless woman who saves your life than just giving her a chintzy ornament before you run back to the palatial, gift-filled, pastry-scented room your family is staying in at the Plaza Hotel. Hey Kevin, she doesn’t have a home and she’s alone! Try fixing that problem with your bag of jacks and firecrackers! J: He doesn’t use jacks in this one. D: Oh excuse me, I’m so sorry to have mistaken which pain-inducing toys are at play here. J: Um, yeah… Anyhow, can we talk about the good parts of the movie now? D: Why aren’t you reviewing that instead? J: Cause it’s not Christmas-related. Duh. D: Was there some sort of unbreakable rule established by your best friend/editor that you had to write about Christmas movies? Need I remind you—AGAIN—that Christmas is over? J: So, you liked Catherine O’Hara. Cool. Yeah, she’s always great as Kevin’s Mom. What else? D: That’s it. God, I hate Joe Pesci. J: That’s it? I mean, I totally understand the Pesci pessimism, but you seriously didn’t like anything else? Not even when Kevin magically transports himself to disparate regions of Manhattan in the time it takes for Darlene Love’s “All Alone on Christmas” to finish? Battery Park to The Cloisters in two minutes? Whodathunk!? D: I think you’re grasping at things to write about here because A: you need to write a review since it’s due in a couple of hours and B: you may like “Home Alone 2” in some sort of “sentimental trip down nostalgia lane” kind of way, but you recognize deep down that it’s a pretty terrible movie and not worth writing a review about. J: But the only things I’ve watched this week are marathons of “The Real Housewives of Atlanta” and “Django Unchained” and I don’t think either one of those are what the bed blog wants. “Home Alone 2” is pretty much the only family-friendly thing I could think of when I realized what day it was and that I needed to write my review really, really quick. D: Desperate times call for desperate measures? J: Yeah. But I really do like this one better than the first. It has Tim Curry in it! D: God, you sound sad. Mark would be ashamed. J: This coming from the person who wanted to watch “A Diva’s Christmas Carol” starring Vanessa Williams as Ebony Scrooge? D: Well, at least Ebony learns by the end of her magical journey that the generosity of Christmas means more than just handing a homeless woman a stupid turtledove ornament then ditching her for hot chocolate and croissants. D: God bless us, everyone!